When I first learned to tie my shoes I was taught the simple “bunny ear” method. Apparently this is what little kids are taught until they get older and learn the “real” way grownups tie their shoes. I was told that it’s some nonsense where you make a single loop and then wrap the second lace around it and then do a back flip while clapping your hands and land doing the splits. I may have gotten some of those moves out of order because I somehow never heard of this “adult” version until I was in college. “Haha! That’s so cute that you still tie your shoes like a little kid!” My life drawing professor was kind of a jerk that way. I’m not sure that would work for shoe-tying, and I don’t think I’d regret it. Those extra fingers would slow you down. I don’t tie my shoes anymore anyways. I follow the “Slip-on/off” school of thought: Tie them once and slip them on and off without ever adjusting the laces again. Reminds me of the 4-armed Spiderman from the comics and old mid 90s cartoon. 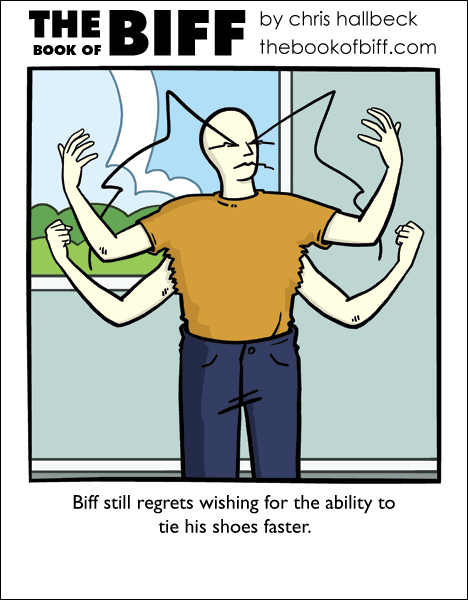 Ahh, but it would be faster… two hands for each shoe, simultaneously. Some people might treat him… a little differently if he ever visits India like that. I first learned how to tie my shoes the “grown-up” way, but I learned to do it by mirroring my parents, so even though I’m right-handed I apparently tie my shoes like a leftie. My dad always jokes that this would be a red herring for Columbo. I’ve only ever heard of one way of tying my shoes. Without actually seeing what they each are I’m going to guess that it’s the “adult” version though. Maybe this is a shameful thing to talk about, but I have something to confess. I’m twenty-four and I still tie my shoes the “little kid” way. When I was taught how to tie my shoes they tried to teach me the “adult” method shortly after, but I just kept using the first way. I never understood, and this still stands to this day, why it’s necessary to learn a new type of knot when the one I already know does the task just as well. What exactly makes the first way only for little kids? Is it the simplicity of it? Because I don’t see how that’s a problem, learning a more complex knot just seems to needlessly complicate things. The only reason I can think of is some kind of misplaced sense of tradition, as if somewhere down the line a cobbler somewhere discovered an easier to learn way to tie shoes and was so embarassed by how simple it was he only taught it to his kids who couldn’t figure out the other way at first, and this method has been carried down through the generations or something. Well tradition can take a hike, I say! I’m not planning in to those conformist complex shoe knot tying ways! Fight the power! I always tied my shoes the adult way. I’ve found that bunny-ears stays tied longer though. @ Chris – I still use bunny ears, too! I thought I was the only one. Kind of a jerk? A jerk. “Be careful what you wish for.” – Elder precursor, Jak 3. How does he wear deodarent now? Evil Genie week! Be careful what you say. He’s listening. What’s this adult way? I just do 1/2 knot, then hold one lace in a loop while wrapping the other lace around it and feeding it through the wrap to make a loop as well. then I tie the two loops together to prevent them from coming undone. I tied my shoes the “little kid” way until high school. My friends didn’t believe me that I couldn’t tie them the “adult” way until they saw me actually tie them and have to concentrate on how to do it. Now I proscribe to the slip-on method. Lisa, that is the grownup way. The bunny-ears way is (I think) to make separate loops (“bunny ears”) and then tie them together in a simple granny knot. I always found that difficult and cumbersome. Oh yeah, also, my mom taught me to use the “lock lacing” method (at the very bottom of the lacing methods page). I find it makes for a nice balance between lace length and stability. Which reminds me, I got a new pair of shoes a month ago and still haven’t gotten around to relacing them with a lock lace. Which is odd since that’s usually the very first thing I do when I get new shoes. Yes…I’ve had wishes gone bad. I wanted to buy something for myself and my father bought me something I was looking for but ended up spending the money. I used velcro shoes for my early years, but eventually learned what I guess is the adult way. I never knew there was any other method. watch what you wish for week. I’m a newer reader, Read all 700 or so comics over the weekend .-. I still tie my shoes like that, too. My parents tried to teach me the other way because they kept coming untied, but I just double knotted them instead. No one taught me to tie my shoes. In fact, I only ever learned this infamous ‘double-knot’ technique in first grade, when I had stopped to tie my shoes for the umpteenth time that day when my teacher said ‘Oh for god’s sake’ and seized my feet by the laces. I was so mortified that I practiced tying my shoes several times that night. I don’t even wear shoes anymore. In Summer I wear sandals or go barefoot. In Winter I wear (depending on how cold it is) these or boots. Svenman, you are now responsible for taking up a good half hour of my time, and a slot on my bookmarks list. Hahaha…I just found this webcomic today….you advertised with Punch an’ Pie….and I’ve gone to the beginning and have begun to read through it. I like it! Tie my shoes….tie my shoes. I don’t remember learning how….but I remember how frustrated I was teaching my little brother. She is greatly enjoying the strip, as well. Yes, another mid-twenties person who has always and forever tied her shoes the “kid’s” way. Bunny-ears are fast, yo. There’s no need for any other method. I didn’t know there was more than one way of tying shoes. Now I wonder if I’m tying my shoes like a child. That page Svenman mentioned was useful in finding a more secure knot. I have the irrational fear of tripping over loose shoelaces. As for 4 arms, that can be handy(no pun intended, nor wanted). I wouldn’t want to have a character with 4 arms, though. I have enough trouble deciding what to do with 2 arms in a comic that I’ve considered having an armless character. In fact, I HAVE cut off a character’s right arm once just because it got in the way(nowhere on my site, though). I had an evil kindergarten teacher who would yell at me when I colored outside the lines who kept me in class either after school or during recess to “teach” me how to tie my shoes. She stood there and berated me while I sat there in tears, having no clue how to do the magical loops to tie my shoes in what I guess is the ‘adult’ way. I ended up getting one, but I had no clue how I did it. I never got to learn the easy way. When I saw the easy way on the TV 2 years later, I was a bit miffed that there was a way to tie shoes that was less mentaly scarring. This comic is awesome, I’ve read through the archives but never got around to posting. I know of a couple of ways to tie my shoes, though never really encountered any hostility to tying my shoes a certain way. I think at the moment the shoes that I wear have two “slip on” styles because I don’t really prefer one style over another. v.v no one ever bothered to teach me the real way. Honestly, I never figured out the supposed ‘adult’ way of shoe-tying until I was 16. I’m 23 now and still don’t use it. Bunny ears go so much faster and wrapping both loops around creates a nice double knot. But really, shoes can burn. If I could, I’d go barefoot everywhere. Unfortunately Canadian winters don’t allow that. Oops, I meant to post that on today’s. i actually learned when my dad let me in on the secret that it was almost the exact same thing as tying the strings the back my dress; just revolved to my feet. i had been tying my dresses since i was in 1st, i didn’t learn to tye my shoes till 3rd. I could never figure out the “bunny ear loop” thing for tying shoes, until my grandfather told me I could just knot two loops together. I still don’t understand why people think everything for kids has to be made unnecessarily complicated so it’s “cutesy”. I admit that I never got the bunny ears way. Dx That story just never clicked with me. So I’ve always tied it the ‘adult’ way. He looks like General Grievous. There’s an adult way? I have to tie my shoes, one can’t tie boots only once, unless one plans on leaving them on their feet forever. Imagine the boot feet from that! <- I only own bots, no shoes. And one pair of Mandles.